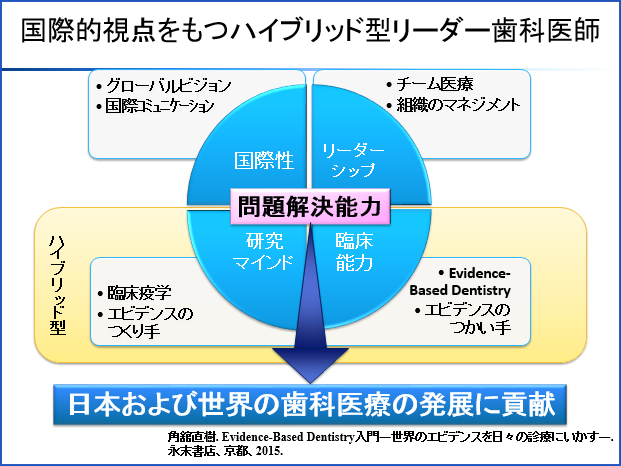 Evidence-Based Dentistry & Practice-Based Research: Lessons learned in Japan. University of Florida College of Dentistry RDS seminar, November 2015, Florida, USA. Essential competencies for the new Japanese dentists: toward outcome based dental education. The 3rd Asia-Pacific Conference in Fukuoka, January 2015, Fukuoka, Japan. What is the competency for the new dental graduate? The Kyushu Dental University Centennial Dental Education Conference, May 2014, Fukuoka, Japan. The current status and future direction of dental education in Japan. The 2nd Asia-Pacific Conference in Fukuoka, January 2014, Fukuoka, Japan. Evidence-based dentistry and dental practice-based research. 2nd Asian Conference of Dental Educators and Researchers, March 2013, Islamabad, Pakistan (via Skype). Assessment and enhancement of self-efficacy in patient and dental education. University of Michigan, School of Dentistry Scholars Program in Dental Leadership Seminar, June, 2012, Ann Abor, USA. © 2016-2018 九州歯科大学歯学部歯学科健康増進学講座臨床疫学分野 All rights reserved.